Weekend schedules are increasingly complicated for people (making regular church attendance challenging). In our local context, Disney is the #1 employer. Mickey asks most of his employees to work on the weekends. The truth is, unconventional work hours are increasingly becoming the norm across many industries today. In addition, the rise of club programs and sports activities for kids have forced parents to choose between athletics, travel, other extra-curricular events, and church participation. We believe there are thousands of people (within a short distance) who might like to go to church but who are not able to do so because their schedules do not allow it. Our City Church team feels tugged to try an “out-of-the-box” experiment to reach this demographic for Christ. Through a study we did last Fall, we learned that there are about 20% of people in our database who do not attend City Church (currently) but who articulated that they would if there were an option that worked for them. Now, factor in those we aren’t even talking to yet… there might be enough to start a service there. As a pastor, that sounds as much like an open door as anything I have ever seen. So here’s what we are going to do. The message will be identical to Sunday (think of it as an “early weekend” service). The worship will be acoustic and significantly shorter (just a couple songs at the top). It would start at 7:07pm and we are calling it “Lite” because the goal is for the whole thing to be done by 8:00pm. We are hoping that adding this third service option allows new folks to attend and helps current “City Church-ers” to be able to come more frequently (if they’ll be out for the weekend for something). If the Sunday attendance rhythm currently works for you, please keep it up. It’s very important to us that the “Sunday Engine” stays strong. If you’re reading this and you don’t currently come [and this pumps you up] OR you think you might be able to come more regularly because of this new possibility, would you please let us know? You can do so by leaving a comment on this blog below, emailing me at kyle@lovehopecity.com, or connecting with us by leaving a comment on social media that you are interested. We are building the “interest list” right now. Our goal is to identify 50 individuals to help us kick-start the service in the next 30 days. Is God asking you to be a part of that group? Either way, would you pray for us? Please pray that God gives us wisdom and favor to use this service to reach more people for Christ. The tentative plan is to run the 6-week trial Thursday March 7th-April 11th. Last thing: we welcome your input into how we might make this work or make it better. You are our best resource! Hello i was wondering if Thursday church is still going on and if there is a nursing mothers room? Hi Stacy! 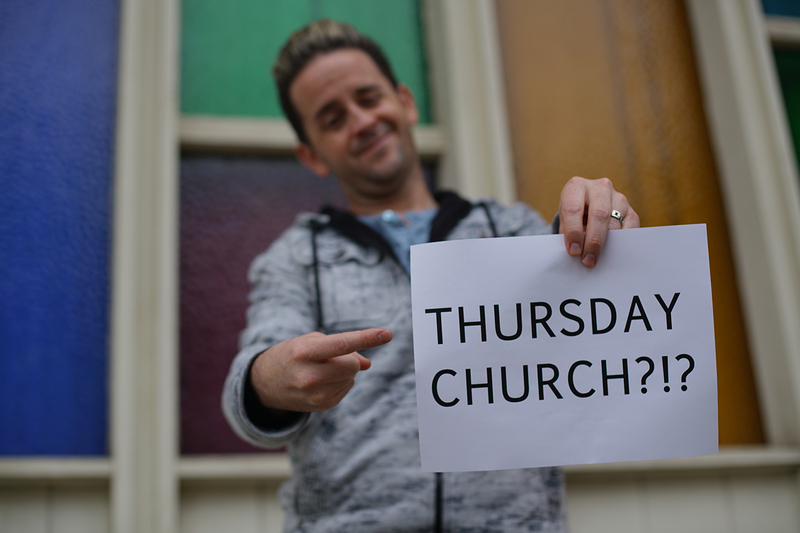 Great question and yes we decided to extend Thursday nights for another 6 weeks starting tonight Thursday April 25th. As to the nursing mother area, we are offering a lightened version of City Kids so I’m not sure the age of your child but you could put them in there if you would like. Otherwise, you could just hang out in the back part and nurse her towards the rear portion of the room if he/she gets fussy. If you have any questions give us a call at (714)795-3945 or email us at hello@lovehopecity.com and we’ll get right back to you.